Written by Jennie on 10 June, 2013 . Raspberry Overnight Oats are simply delicious! I kept seeing recipes on the popular healthy food blogs, but as if often the case, life is busy. Then I decided I had to try them out for myself. And in one try I was converted especially because they are so quick and easy – and nutritious too! I can see endless possibilities using different fruit, spices or adding seeds and nuts – but for now you may like to try my first recipe – then experiment and let me know what turns out to be your favourite. I have and used a small kilner jar – but you could easily use a plastic pot or even a large mug and cover it with cling film. Sprinkle cinnamon and seeds evenly over the oats. Place raspberries on top of the oats. Pour rice milk into the jar. Seal and pop into your fridge overnight. 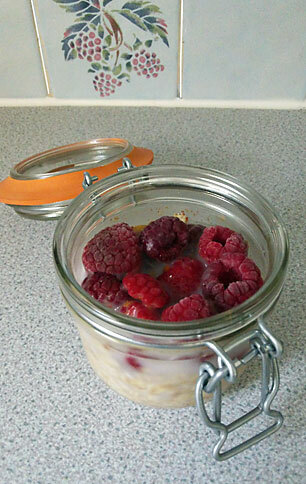 Next morning – it’s ready to eat – straight out of the jar if you wish. The oats will have soaked up the milk and cinnamon and the raspberries have gone soft and sort-of melted into the oats too.